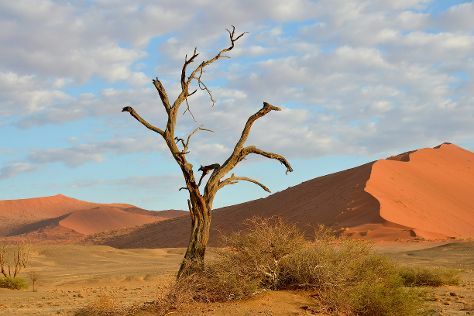 Kick off your visit on the 15th (Sat): admire nature's extreme beauty at Sossusvlei and then explore the fascinating landscape at Namib Desert. Keep things going the next day: head outdoors with Dune 45 and then get outside with Deadvlei. To see ratings, more things to do, and other tourist information, use the Namib-Naukluft Park online itinerary creator. London, UK to Namib-Naukluft Park is an approximately 26-hour flight. 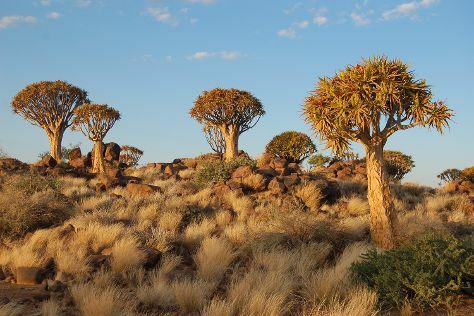 Traveling from London to Namib-Naukluft Park, you'll lose 1 hour due to the time zone difference. Cap off your sightseeing on the 17th (Mon) early enough to go by car to Keetmanshoop. Keetmanshoop is a city in the ǁKaras Region of southern Namibia, lying on the Trans-Namib Railway from Windhoek to Upington in South Africa. To see more things to do, where to stay, maps, and other tourist information, read our Keetmanshoop vacation trip planner. Drive from Namib-Naukluft Park to Keetmanshoop in 9 hours. In July, plan for daily highs up to 25°C, and evening lows to 7°C. Finish your sightseeing early on the 19th (Wed) so you can drive to Luderitz. Start off your visit on the 19th (Wed): explore the fascinating landscape at Agate Beach and then enjoy the sea views from Diaz Point. 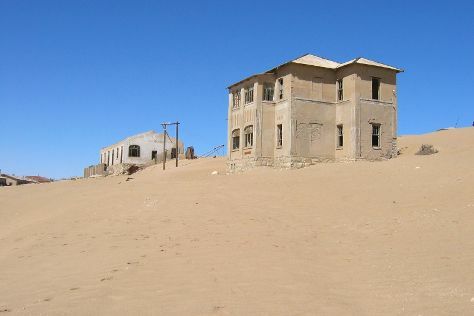 Keep things going the next day: steep yourself in history at The Goerke House, then take in the architecture and atmosphere at Felsenkirche, and then mingle with the ghosts of the past at Kolmanskop Ghost Town. To see other places to visit, maps, where to stay, and other tourist information, read our Luderitz travel itinerary planner. You can drive from Keetmanshoop to Luderitz in 5 hours. In July, daytime highs in Luderitz are 23°C, while nighttime lows are 10°C. Finish your sightseeing early on the 21st (Fri) so you can travel to Windhoek. You'll explore the less-touristy side of things at Fish River Canyon Nationalpark and Okapuka Ranch. Get in touch with nature at NamibRand Nature Reserve and Daan Viljoen Nature Reserve. There's much more to do: take a pleasant ride with a tour on horseback, tour the pleasant surroundings at Zoo Park, see exotic creatures in open habitats at a safari tour, and see the interesting displays at Trans-Namib Railroad Museum. For maps, where to stay, more things to do, and more tourist information, read Windhoek trip itinerary builder. You can do a combination of flight and car from Luderitz to Windhoek in 2 hours. Alternatively, you can drive. In July, daytime highs in Windhoek are 26°C, while nighttime lows are 9°C. Finish your sightseeing early on the 26th (Wed) so you can travel to Walvis Bay. Step out of the city life by going to Long Beach Leisure Park and Kayaking & Canoeing. Step off the beaten path and head to German Evangelical Lutheran Church and Kristall Galerie. Get out of town with these interesting Walvis Bay side-trips: Swakopmund (Karakulia Weavers & Welwitschia Plains, A Scenic Drive). The adventure continues: take a leisurely stroll along Swakopmund Jetty, see exotic creatures in open habitats at a safari tour, look for all kinds of wild species at Dune 7, and get a dose of the wild on a nature and wildlife tour. For other places to visit, reviews, maps, and more tourist information, you can read our Walvis Bay travel itinerary planner. Getting from Windhoek to Walvis Bay by combination of car and flight takes about 1.5 hours. Other options: take a bus; or drive. 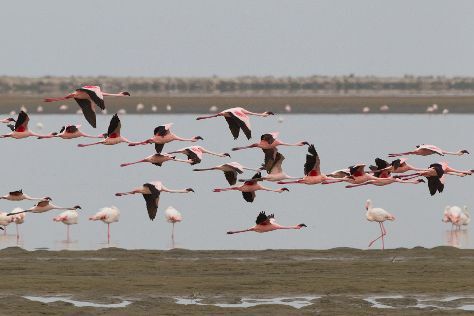 In July, daily temperatures in Walvis Bay can reach 26°C, while at night they dip to 11°C. Wrap up your sightseeing on the 29th (Sat) to allow time to travel back home.